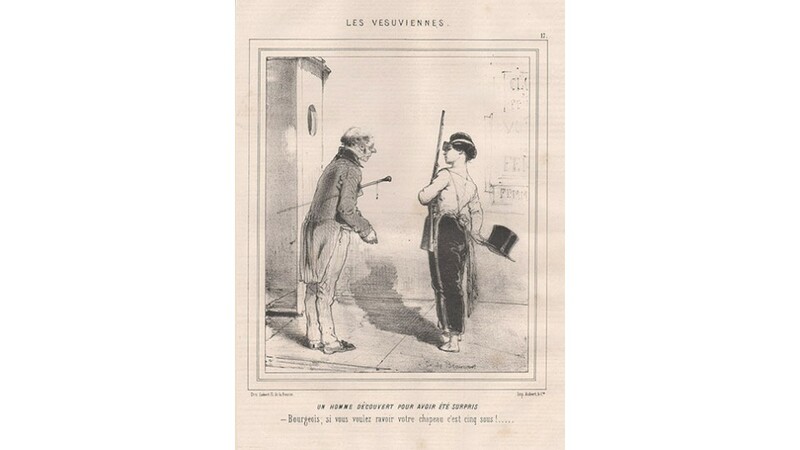 Un homme decouvert pour avoir ete surpris' Lithograph from 'Le Charivari'. The Vesuviennes were a radical feminist group that existed in France in the middle of the 19th century. They chose their name because, in their words, "Like lava, so long held back, that must at last pour out around us, (our idea of feminist equality) is in no way incendiary but in all ways regenerating." With the overthrow of King Louis-Philippe of France in 1848, the newly formed Republic lifted all restrictions on the press and assembly. This encouraged a proliferation of new feminist publications, organizations, and groups. The Vesuviennes were among the latter. 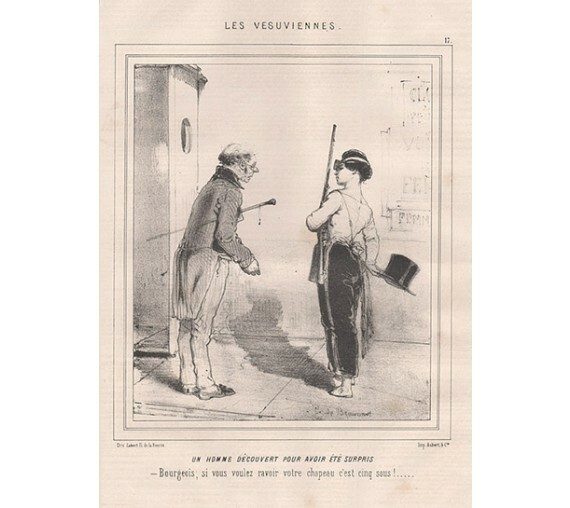 Considered to be the most radical of all of the feminist factions of the time, the Vesuviennes promoted female military service, the right of women to dress the same as men, and legal and domestic equality between husband and wife, even as that extended to the distribution of household chores. 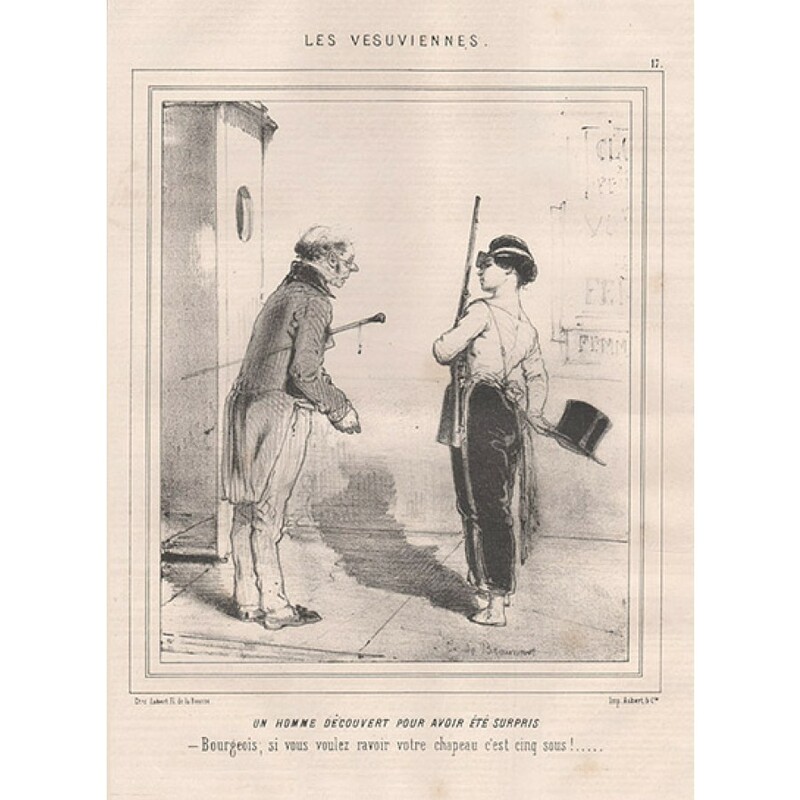 The image of a young woman in culottes came to represent all feminists to some, as can be seen in the caricatures of Edouard de Beaumont, one of several artists who satirized the efforts of feminists of the period in popular political papers such as Le Charivari. Text on the reverse as issued. Faint ink off-setting and foxing.